Special Containment Procedures: SCP-1660-1 may be safely kept in a locked safe-deposit box at Site ██ Storage Facility. Standard positive-action defenses (explosive, chemical, biological, and memetic) are to be in place at all times, according to standard operating procedure. SCP-1660-1 is to be kept away from flammable materials unless in testing. Under no circumstances is SCP-1660-1 to come into contact with fire-related SCPs such as SCP-███. In event of SCP-1660-1 igniting outside, testing personnel are to evacuate the area until all flaming materials are extinguished. Due to only being accessible via SCP-1660-1, SCP-1660-2 can be considered to be contained as long as SCP-1660-1 is. Any animal life that emerges from SCP-1660-2 during testing is to be captured pending study and possible termination. 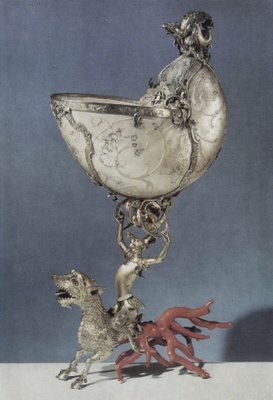 Description: SCP-1660-1 is an elaborately decorative oil lamp made from silver, coral and the shell of a nautilus. Its anomalous effects activate if a fire is lit inside the chamber of the nautilus shell. Upon ignition the fire will, regardless of materials used, begin to emit large amounts of smoke. The smoke will begin to gather forming an arch-shaped "gate" in the air approximately ██ meters across. The size and stability of said "gate" will fluctuate based on the amount and/or type of material being burned within SCP-1660-1. In the event of SCP-1660-1 being extinguished, the gateway will collapse rapidly. SCP-1660-2 is a miniature parallel universe consisting of approximately █████ square kilometers of temperate forest conditions which can be accessed by means of the "gate" produced by SCP-1660-1. Around the edges of SCP-1660-2 are walls of an as-of-yet unidentified mineral rating up to ███ on the Mohs scale. Testing with diamond drills have been unable to damage the mineral while rapidly blunting drill bits. Roughly a kilometer above the treetops is what appears to be a layer of [DATA EXPUNGED] all aerial exploration is to be performed with unmanned aerial vehicles (UAVs) following incident ████████. Attempts at drilling below ground have revealed that a crust of the same unidentified mineral making up the walls exists approximately half a kilometer under the entire area of SCP-1660-2. Anax imperator Emperor Dragonfly Specimens have been seen to reach sizes of up to ██ millimeters. How they are able to breathe via spiracles while at these sizes is unknown. N/A SCP-1660-7 [DATA EXPUNGED] A two (2) meter long extremely dangerous reptomammalian creature resembling an armored, bio-luminescent [DATA EXPUNGED]. SCP-1660-7 are pack-hunting predators comparable in behavior to wolves, although they do not fear humans and are capable of climbing trees or the walls of SCP-1660-2. Due to their lack of fear for humans they have been noted to attack personnel in SCP-1660-2, frequently killing them. Under no circumstances are personnel permitted to approach SCP-1660-7 specimens for this reason as well as [DATA EXPUNGED]. Quercus aliena Oriental White Oak Specimens grow considerably larger, reaching up to ███ meters in height compared to ordinary members of their species. History: SCP-1660-1 was recovered on ██/██/████ by Agent ██████, a Foundation mole from ██████, a front for Marshall, Carter and Dark, who were selling "safaris" into SCP-1660-2 to hunt local wildlife (primarily SCP-1660-5, SCP-1660-6 and SCP-1660-7). The information in the article that you've already read left out, or more accurately expunged, something quite important. They aren't simply some kind of dangerous predator. We said that to keep personnel away from them. They're sapient. Their fore-paws are jointed to work like human hands. They have simple tools, fire, and a language of their own based on bio-luminescent patterns.